We closed last week’s blog post with the finding that management and leadership are two sides of one medal – a successful organization, can’t do without either one. This leaves us still with the question, what are leadership essentials? As with many things, especially something that is to a great degree situational like leadership, there is no one and only, all-time truth to this question. Even so, there are leadership traits that stood the test of time and proved useful for those who are most successful at leading. It is the number one buzz word when it comes to leadership and one of the oldest ones associated with leadership, too. As early as 1989, Warren Bennis differentiated leaders from managers by claiming the former ones are visionaries and the latter ones administrators. Instead of accepting the status quo, a leader should always set eyes on the horizon and have a good image of what he wants the organization to look like in the future. In a rather idealistic approach, leaders should live for this vision and be willing to subsume their individual aspirations for the greater goal. Leadership is constant communication. That means, having a vision is just as important as communicating it. In order for others to be inspired and motivated, they need to understand what the goals are and how they are expected to be achieved. Effective leadership, to great degree, is based on the trust that leaders are given by their peers and team. A great way to build trust is invite those who are part of a joint effort to share their ideas. An environment that gives everyone on the team the chance to participate in a dialogue not only suggests that they are a vital part of the mission. Creating a group of “counselors” increases transparency and motivation. As the person in the leadership position, you are, by far, outnumbered and you need your team’s support to achieve your goals – leadership is not a one-man show. No matter how experienced a person in a leadership position is, the ones who work for them have essential knowledge and expertise to the table. Effective leadership seeks to create an atmosphere in which everyone on the team feels included and valued for their uniqueness. It is an old wisdom that you are best at what you like the most. This also goes for leadership: If you are passionate about your job and the field you work in, you will excel at driving business to success. Referring to Warren Bennis, while managers make sure to do things right, a leader does the right thing. And instincts will guide you best if you love what you are doing. Leaders play a critical role on every level of our life, not only in a corporate and business environment. We mostly notice their effect in the frustration that is caused by ineffective leadership, whether it is in a professional environment, project management related context or in our private life. Despite the array of books that have been published and academic research that has been conducted in an effort to illuminate leadership, it is still one of the things most difficult to develop. This is certainly due to the fact that there is not one path to great leadership. However, it is important to keep in mind that leadership goes beyond charisma and it actually is a set of skills that you have the power to develop. As mentioned before, leaders are the basis of any company's ongoing success in the future. 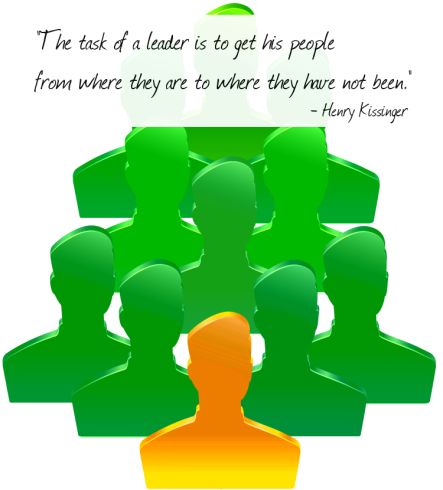 Therefore, current executives and leaders should encourage the development of leadership potential in their employees. 5 Rules to Lead By - InLoox • Copyright 1999-2019 © InLoox, Inc. All rights reserved.